A creamy and comforting chicken bake the whole family will love. The unusual crumbled topping adds great crunchy texture - why not see who can guess the secret ingredient? 1. Preheat the oven to 200ºC, gas mark 6. Heat 1 tbsp of the oil in a large pan and cook the chicken and bacon over a high heat for 5 minutes until nicely browned. Add the leeks and thyme and cook for a further 2–3 minutes until the leeks are softened. 2. Stir in the cheese sauce, cover and simmer gently for 5–10 minutes until the chicken is cooked through. 3. Meanwhile, stir the remaining oil into the breadcrumbs then mix in the Sunbites crumbs and parsley. 4. 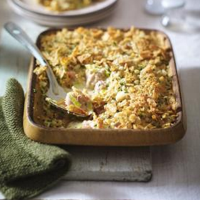 Spoon the chicken mixture into an ovenproof dish and scatter over the Sunbites crumble. Place the dish on a baking sheet and cook for 10–15 minutes until crunchy and golden. Serve with a mixed green leaf salad or steamed seasonal vegetables.